A heavy-lift Proton-M rocket blasted off from the Baikonur Cosmodrome on Monday, carrying the Russian-European ExoMars 2016 spacecraft to set out on a nine-month journey to Mars for an ambitious mission of discovery to unlock the secrets of the Martian past and present. 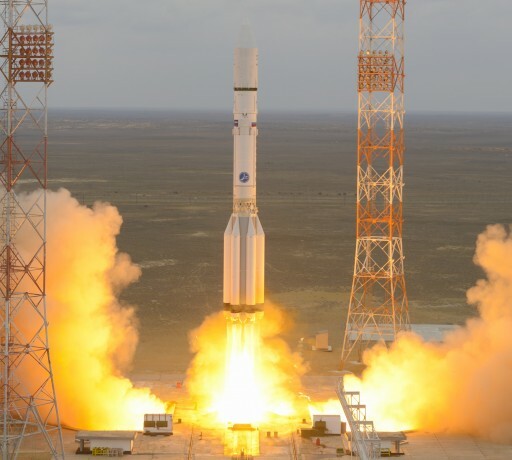 The 58-meter tall Proton rocket lifted off from Site 200/39 at 9:31 UTC, rising with a total thrust of over 1,000 metric tons, departing Kazakhstan to the north east in the launcher’s first interplanetary mission in nearly two decades. Ascending through the dense layers of the atmosphere, the rocket’s first stage fired its engines for two minutes before handing off to the second stage for a three-and-a-half minute burn. The 4,300 Kilogram Trace Gas Orbiter and Schiaparelli Lander were revealed when the payload fairing separated during the firing of the rocket’s third stage. 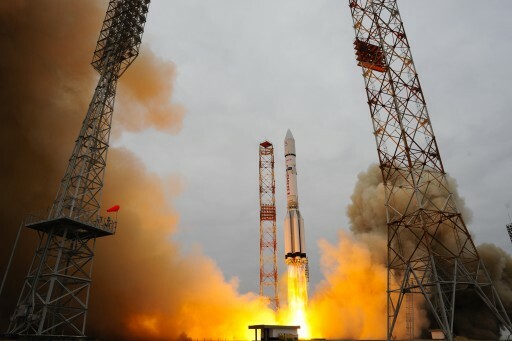 Proton finished its job nine minutes and 42 seconds into the flight after a flawless ascent mission, to the relief of the Mission Team and many onlookers as the selection of the Proton rocket had caused some anxiety given the vehicle’s recent reliability struggles. But the mission is far from over as the Briz-M has taken over control for an ascent lasting throughout the day on Monday with spacecraft separation after four firings of the Briz-M main engine, nearly 11 hours after liftoff. Briz-M successfully carried out its first engine firing immediately after separating from the Proton booster, lifting the stack into a Low Earth Parking Orbit. Before departing for Mars, Briz-M will make nearly three laps around the planet, firing its engine to methodically raise its orbit ahead of a final push to enable ExoMars to depart Earth’s gravitational influence and head to Mars for arrival in October. ExoMars is a multi-billion Euro project by the European Space Agency and the Roscosmos State Corporation comprised of a pair of flights to Mars. The project looks back at a decade-long history that saw a number of different proposals for Mars missions in an initial collaboration of ESA and NASA before the U.S. had to pull out of the project for budgetary reasons leading to ESA and Roscosmos joining forces for a pair of missions to our neighbor planet in the Solar System. 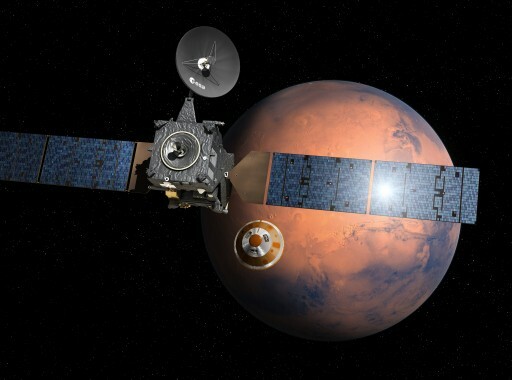 The ExoMars 2016 mission aims to deliver to Mars the Trace Gas Orbiter for a multi-year science mission studying the tenuous atmosphere, and the Schiaparelli Entry, Descent and Landing Demonstration Module, set to test out the technologies needed for a landing on Mars followed by a very short-duration science mission on the surface. The 2016 mission will pave the way for the second launch in 2018 or 2020 with a European-built rover and an instrumented landing platform built in Russia. 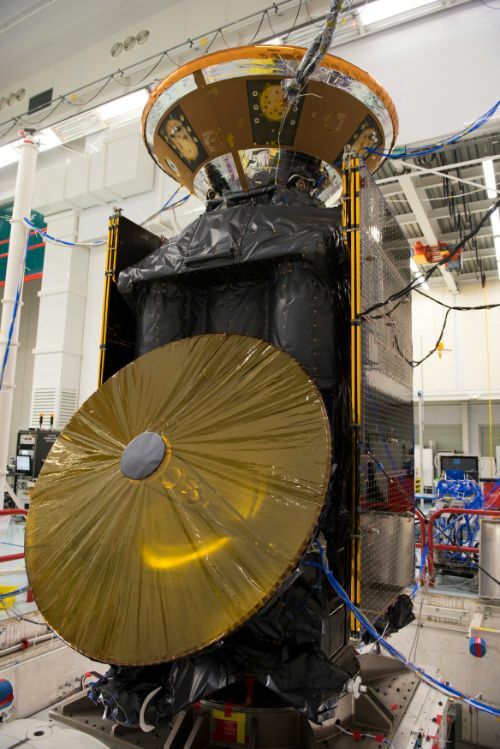 The Trace Gas Orbiter, built by Thales Alenia, is outfitted with a pair of sophisticated spectrometer payloads to conduct the most detailed study of trace gases in the Martian atmosphere, capable of detecting minor atmospheric constituents at concentrations of a few parts per billion, also delivering high-resolution vertical profiles of the atmosphere in never-before-seen resolution to study the structure of Mars’ extremely thin atmosphere. The orbiter also hosts a high-resolution imaging camera to tie phenomena seen in the atmosphere to geological processes ongoing on the surface, and a neutron detector will be used to peer below the surface and create a high-resolution map of water in the Martian subsurface. 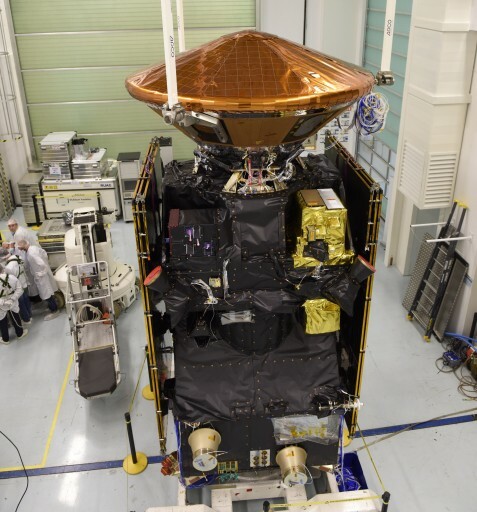 The 600-Kilogram Schiaparelli lander, hitching a ride atop the Trace Gas Orbiter, is set to make its landing on Mars on October 19, gathering engineering and atmospheric data while descending towards the surface for a propulsion-assisted landing at Meridiani Planum. Outfitted with batteries, Schiaparelli will only last about four Martian Days until running out of power, gathering environmental data with a suite of sensors. Pending the outcome of Monday’s launch, the 4,332-Kilogram ExoMars 2016 spacecraft will become the heaviest vehicle ever to be sent on a path to Mars. 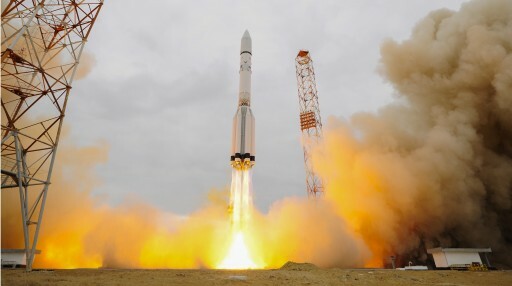 It is the first Mars mission with Russian involvement since the 1996 Mars96 and 2011 Phobos-Grunt failures – both spacecraft had been heavier than ExoMars but never made it beyond the orbit of Earth – the first left in an extremely short-lived orbit after a misfire of its Block-D upper stage and the second ending up stranded due to radiation-related damage before being able to set its course to Mars. Monday’s liftoff marked the culmination of a three-and-a-half-month launch campaign at the Baikonur Cosmodrome, starting at the end of December when the ExoMars spacecraft arrived in Kazakhstan for final launch preparations, fueling and integration with the Proton rocket. The preparations flow was very smooth with no issues on either the spacecraft or launcher side, allowing ExoMars to meet its Proton rocket early in March after having already been mated to the Briz-M.
Proton was moved to the launch pad on Friday and entered three days of final testing of the launcher and spacecraft systems, revealing all was in readiness for Proton’s first mission beyond Earth Orbit since the ill-fated Mars96 flight. The lengthy overnight countdown picked up at 21 UTC when the first shift of Mission Controllers reported for duty at the European Space Operations Center in Darmstadt from where the ExoMars mission will be controlled. 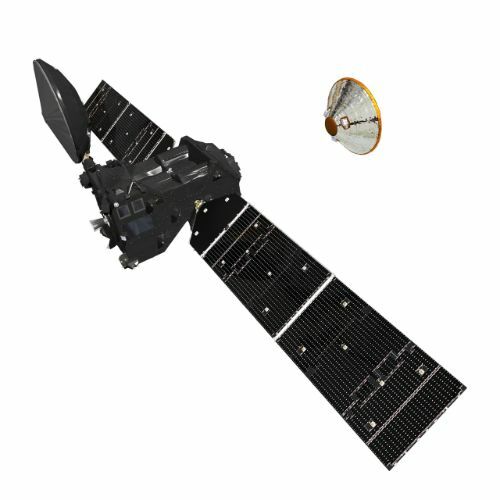 Spacecraft activation occurred half an hour later and ExoMars finished battery charging at T-10 hours and 48 minutes followed by the transition to its Flight Software Package to enter the proper configuration for liftoff. With ExoMars in launch mode, ESOC completed data flow tests with the Malindi, Maspalomas and Kourou ground stations to ensure data received from ExoMars will be relayed to ESOC. For the rest of the countdown, the team watched over the spacecraft’s health and prepared the ground segment for mission operations. Proton-M headed into countdown operations at T-11.5 hours when Briz-M was powered up for extensive testing and flight software load. 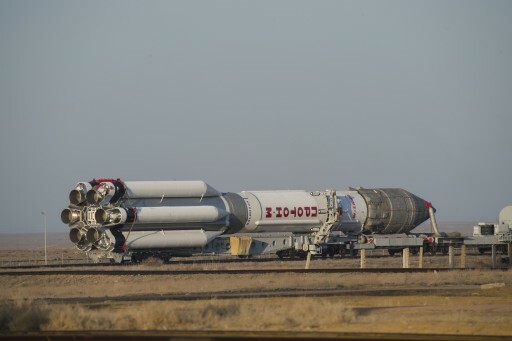 The Launch Complex was closed at T-7 hours, ahead of the start of hazardous propellant loading operations at T-6 hours, marking the start of a three-hour process to fill the three stages of Proton-M with 622 metric tons of toxic Unsymmetrical Dimethylhydrazine and Nitrogen Tetroxide. 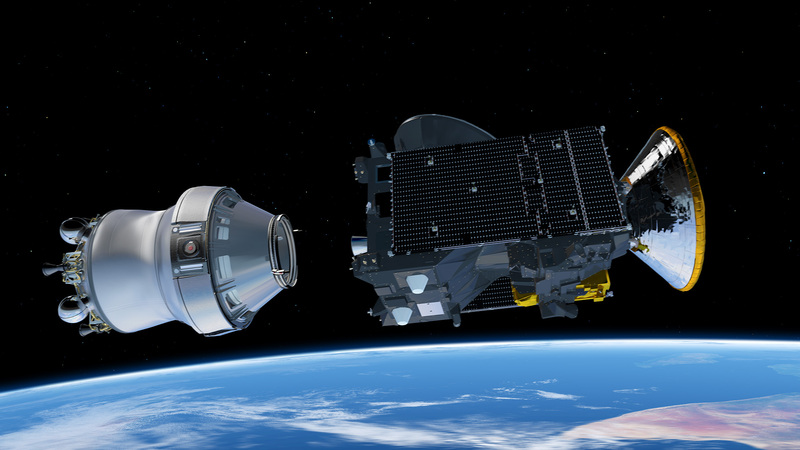 The Briz-M had received its dose of hypergolics earlier in the week prior to the rollout. Once fueling was complete, the pad was re-opened for final close out operations. 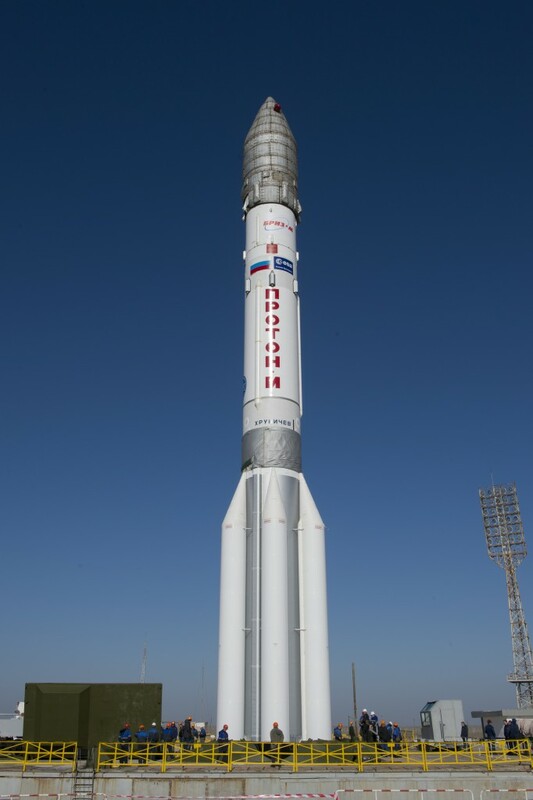 Proton was revealed at T-1 hour when the protective Service Structure was rolled to its launch position. Teams departed the complex and ExoMars was commanded to switch from external power to its batteries to be ready for liftoff. A final GO from the spacecraft team was voiced to the Launch Team and Proton was allowed to press into its final preparatory steps as part of a five-minute automated countdown sequence. Heading into the business end of the countdown, Briz-M was switched to internal power, all sequencers were synchronized for T-0, Proton aligned its triple redundant flight computers and pressurized its tanks for launch. The vehicle assumed control of the count at T-1 minute and 53 seconds and a last automated health check occurred at T-3 seconds. Upon completion of the health poll, Proton commanded its engine to fire. The six RD-275M engines on the first stage started breathing fire at T-2.5 seconds, throttling up to a collective liftoff thrust of 1,014 metric-ton-force. Proton does not use a hold-down system and lifted off as soon as the engines overcame the weight of the 712,800-Kilogram rocket, triggering the Contact Liftoff Command to signal to Proton’s computers that flight has begun. All fingers were crossed for a successful Proton flight when the vehicle jumped off its pad at precisely 9:31:42 UTC, heading into cloudy skies over the Baikonur Cosmodrome. Proton balanced in a vertical posture for ten seconds before starting a pitch and roll maneuver to get aligned with its planned 61.3° launch azimuth, the standard departure route for Proton. For Proton, Monday’s flight was no different than any regular Geostationary Transfer Mission as the launcher’s part is to deliver the Orbital Unit to a sub-orbital trajectory for either case, sticking to similar flight paths. 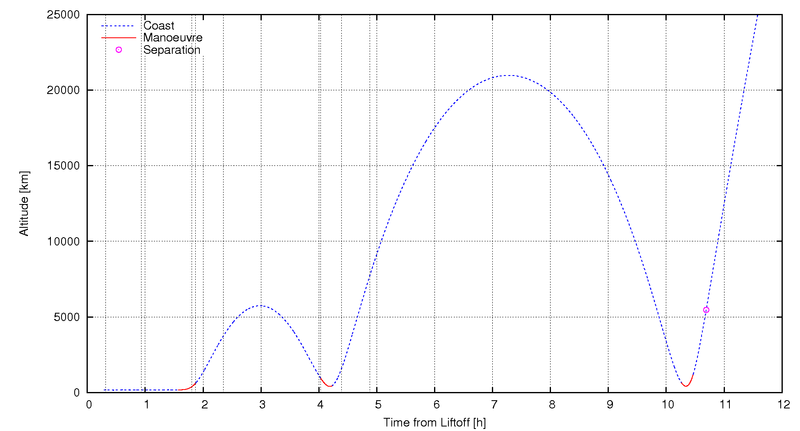 Proton passed Mach 1 and encountered Maximum Dynamic Pressure one minute after launch, its engines ingesting 3,500 Kilograms of self-igniting propellants per second. 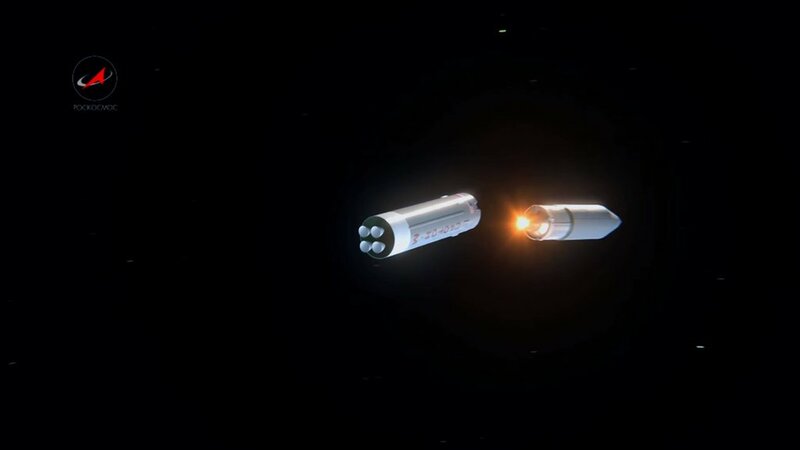 The first stage finished its job one minute and 58 seconds after liftoff, followed split seconds later by the hot staging sequence in which the 21.2-meter long booster was separated at the same moment the second stage’s engines began to fire. Assuming control of the flight, Stage 2 started out at an altitude of 43 Kilometers and a speed of 1.73 Kilometers per second. With its four engines, generating 244 metric-ton force of thrust, the second stage accelerated the stack to 4.5 Kilometers per second in a burn lasting three minutes and 28 seconds. Staging between the second and third stage occurred 130 Kilometers in altitude, beginning with the ignition of the RD-0214 vernier engine of the third stage at T+5:24 to assist in the separation. Three seconds later, the second stage shut down and pyrotechnics separated the two stages with retrorockets moving the 14.5-meter second stage away, set for re-entry towards a crash landing 2,000 Kilometers from the launch pad. Ignition of the RD-0213 main engine of the third stage was confirmed five and a half minutes into the flight. The third stage of the Proton rocket was responsible for accelerating the vehicle to 7.2 Kilometers per second, placing it on a sub-orbital trajectory with a 180-Kilometer apogee and a negative perigee around -500km. Fifteen seconds into the burn of the third stage, the protective payload fairing was jettisoned, revealing ExoMars for the rest of its journey – Schiaparelli, affixed to the top of the Trace Gas Orbiter, had the front row seat in Monday’s ascent, facing its heat shield towards the direction of travel. Heading towards space with over 60 metric ton-force of thrust, the third stage finished its main engine burn at T+9:31 while the four-chamber vernier fired for another ten seconds to optimize the insertion accuracy. 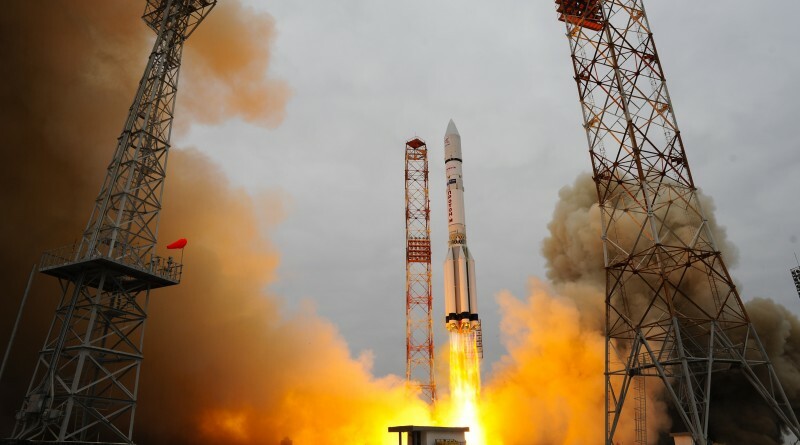 The Briz-M upper stage was sent on its way nine minutes and 42 seconds after liftoff – the completion of Proton’s part in the ExoMars 2016 mission to the relief of many who were watching the launch. The 22,170-Kilogram upper stage was first tasked with boosting the stack into a stable orbit. Briz-M stabilized its orientation and began settling its propellants ahead of main engine ignition at T+11 minutes for a 4.5-minute burn of the 2,000-Kilogram-force S5.98 main engine. This initial firing aimed for a circular Parking Orbit 175 Kilometers in altitude at an inclination of 51.5 degrees. 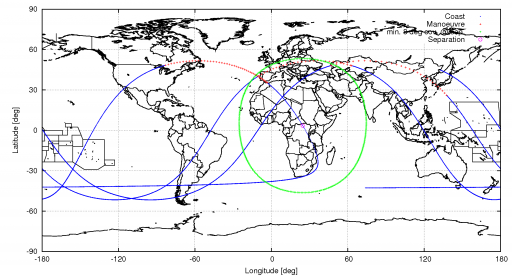 Entering orbit, Briz-M is set for nearly an entire lap around the planet to gear up for the start of the second burn one our and 34 minutes after liftoff for a firing of 18 minutes, stretching from the south-western border of Kazakhstan, over Mongolia and China and out over the Pacific Ocean. This burn aims for a Preliminary Orbit of 270 by 5,800 Kilometers. The next two burns will both occur around the perigee passes of the vehicle. Briz-M can not achieve the required change in velocity in a single burn due to the low thrust of its main engine, requiring the Trans-Martian Insertion to be broken into two burns and bringing the total ascent duration close to 11 hours. Burn #3, set to start at the T+4-hour mark, will last approximately 12 minutes and lift the stack into a highly elliptical orbit of 300 x 21,000 Kilometers. The burn starts when Briz-M is over the Atlantic, about to cross over Portugal and takes the vehicle across central Europe, all the way to central Kazakhstan. About a minute after the burn is complete, Briz-M will shed its Auxiliary Propellant Tank which will be the only object related to this mission to remain in Earth Orbit. Swinging around the high apogee and firing again at perigee will require the stage to coast for six hours. 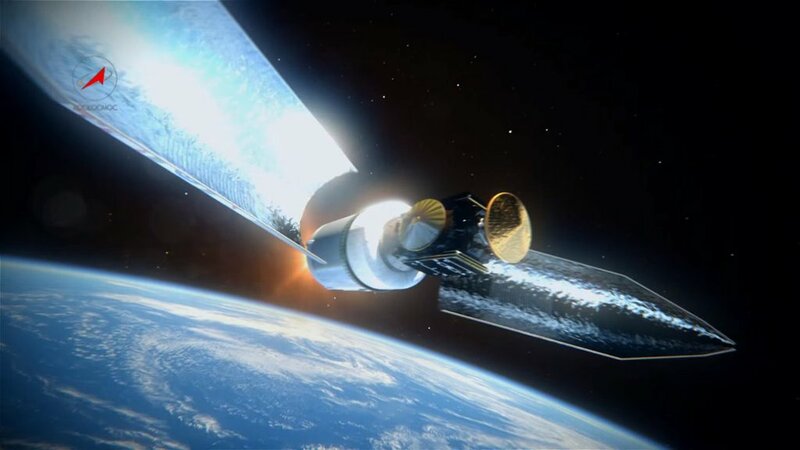 At perigee, the engine of Briz-M will be lit once again, the burn starting out at a blazing speed of 9.8 Kilometers per second and aiming to further raise the stack’s speed to be able to overcome Earth’s gravity. 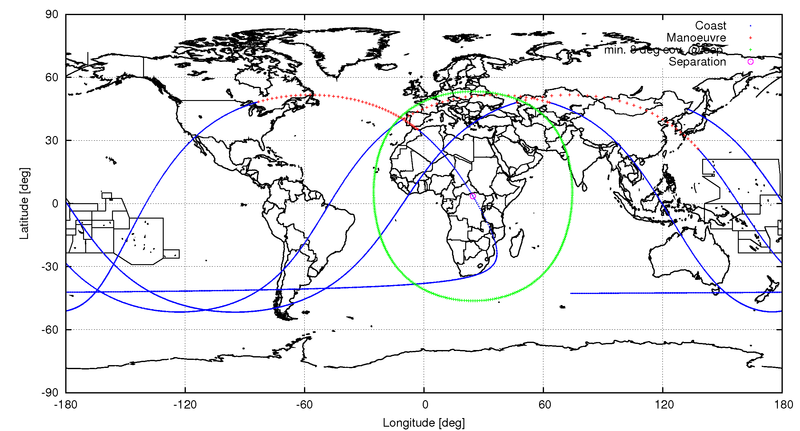 Ignition on the Trans-Martian Injection is set for T+10 hours and 19 minutes and the burn will take the Briz-M from from the Great Lakes over Canada, the Atlantic Ocean and to North Africa for a total duration of 10 minutes. Spacecraft separation occurs 12 minutes after the last burn, ten hours, 41 minutes and 19 seconds after liftoff. First contact with the ExoMars spacecraft after separation is expected at 21:28:26 UTC through the Malindi ground station in Kenya, 76 minutes after spacecraft separation.